Scroll down and click on "Hear from the curator" to watch a short video, or click on "Explore hippie fashion" for a slideshow. Click on and drag the picture to rotate it. Click on "Enlarge Image" for a bigger picture. To see a paper Pop art dress, scroll down and click on "The Souper Dress". Click on fashions for bigger images and info. Watch a video about everyday life in "Swinging Britain"
The Apollo 11 mission put people on the Moon for the first time in 1969. The Beatles had a huge influence on 1960s men's fashions. Click on "360 view of the living room" to begin. 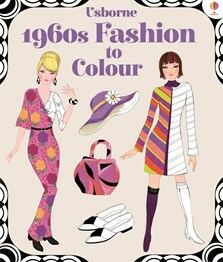 With funky minidresses, flamboyant flares and trendy accessories to colour, this book provides a stylish introduction to the fashions of the 1960s. Each page has snippets of information about a new trend, from ‘mods’ and swinging London to dresses inspired by the space race and pop art. Ideal for fashion-lovers and vintage enthusiasts of all ages.